Get those headphones ready because The Cinema Guys and The Cinemaiden have a high octane episode this week! First they play a little game called “Who Would You Cast?” Then they turn up the volume and floor it for Baby Driver. Be ready with your pen and paper when they down shift because you won’t want to miss these at home recommendations! Thanks for listening! The Cinema Guys would love to hear from you! 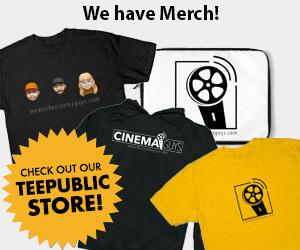 Send a suggestion, comment, or a request to wearethecinemaguys.com/contact If you enjoy the show help The Cinema Guys out and become a patron! Get Baby Driver on Amazon.